Home Modern Mysteries The unsolved mystery of the Van Meter Visitor – a winged creature! The unsolved mystery of the Van Meter Visitor – a winged creature! A bizarre legend and unsolved mystery which has haunted a small Iowa town for more than 100 years is the subject of a new book called The Van Meter Visitor. 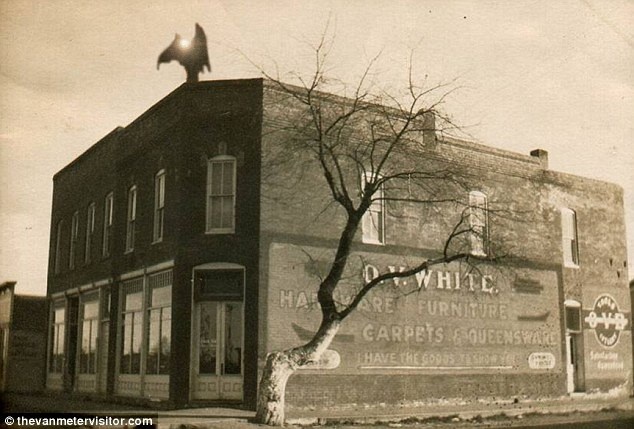 For several nights in 1903, the small town of Van Meter, Iowa was terrorized by a giant bat-like creature that emerged from an old abandoned mine. The identity of this mysterious monster has never been discovered, but over 100 years later a new book is retelling the amazing tale and hoping to shed some light on what happened all those years ago. The legend dates back to the fall of 1903, when several of Van Meter’s most well respected citizens reported a half human, half animal with enormous, smooth bat wings flying about. The creature is described as moving at speeds the townsfolk had never witnessed before, plus it let off a powerful stench and shot a blinding light from its horned head. Each time the townsfolk encountered the creature they fired their guns at it, but this appeared to have no impact on the creature. On the third night, a man spotted it perched atop a telephone pole. Another resident who saw it, described the monster as hopping like a kangaroo, while the local high school teacher likened it to a devil. Scared and angered by what they had witnessed, the townsfolk followed the creature to an abandoned coal mine near an old brickyard where they heard a noise from the mine. ‘Presently the noise opened up again, as though Satan and a regiment of imps were coming forth for battle,’ reads an article in the Des Moines Daily News from Oct. 3, 1903.